After four year of pilot plan test bed, the Changyi Urban-Rural Sanitation Integration Service Standard has been promoted to the Shandong Province Service Standards. 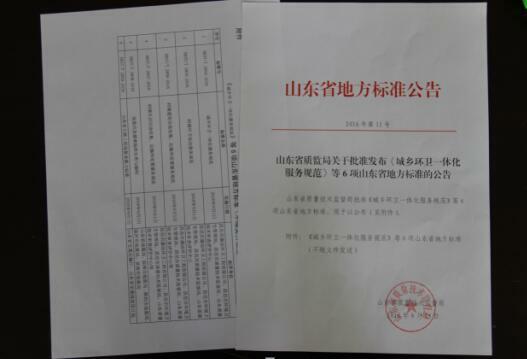 The Service Standards written by Kangjie Group, namely the “Urban-Rural Sanitation Integration Service System”, “Service Standards on Urban and Rural Roads Cleaning”, “Service Standards on Urban and Rural Solid Waste Collection , Transportation and Disposal”, “Service Standards on Urban and Rural Construction, Transportation and Disposal”, were released in the “Announcement of Local Standards, Shandong Province” on 15th, August 2016. The Four Service Standards were promoted to the provincial service standards in whole Shandong province and will be widely implemented. In 2011, Changyi Urban-Rural Sanitation Integration was approved by the Standardization Administration of the People’s Republic of China as a national pilot standardization project in the service industry. Kangjie Group has built the Urban-Rural Sanitation Integration Service Standard featuring the “Government-leading, public participation and diverse investment” model. Kangjie Group has formulated, implemented and promoted the Urban-Rural Sanitation Integration Service Standard, which created the atmosphere where “The Government pays great attention with high regards, standardized perfection in management system, widely implementing the standards and with excellent satisfied customer ”. Combined with the requirements of Integrated Management for “Household, Village,Town and City” and the new mode of “Unified collection, transportation and disposal, resource utilization for solid waste”, the current services, work processes and systems have been optimized, which have set the solid foundation in standardizing them as Operating Standards. The Four Services Standards have become a “model” and aided for its national counterparts to learn and to emulate, and thus played an important role in guiding the sanitation industry in the nation in order to develop a healthy and an orderly growth business path.